Christmas is a bittersweet time. There’s joy in spending the day or days with friends and family, but there are also pangs for those you love who are absent or gone. And then there are the presents: a whole mixed bag in and of themselves. They can range from funny to groanworthy, and from over-the-top to very touching. And sure enough, on Boxing Day 2010, three wise birds came calling. Actually “calling” isn’t quite how most people would describe the sound made by yellow-tailed black cockatoos (Calyptorhyncus funereus). As the three seriously comical birds raucously squawked and flapped and lolloped their way over the valley, they spied a couple of honeysuckle banksias (Banksia marginata) in the garden. For the next quarter of an hour the birds sat in the tree working over the banksia cones to remove the seeds, chattering to each other in a series of low-key scratchy squawks. For the gardener it was like having a child open their present, then leap and squeal with joy. 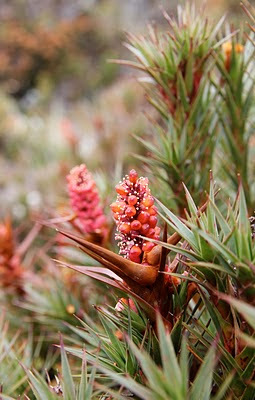 The local bush too is capable of decorating itself for Christmas, and offering gifts to those who seek them. 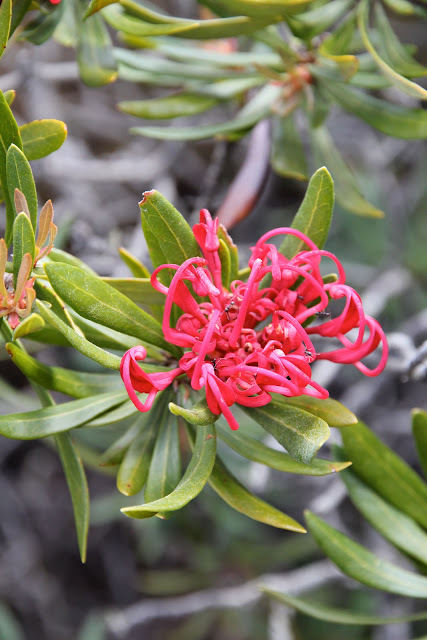 On a Christmastide wander on Kunanyi/Mt Wellington we found Tasmanian waratahs (Telopea truncata) lighting up the bush with their wonderfully red spidery flowers. They obviously have sweet nectar too, judging by the plethora of winged and legged insect life they were attracting. Small patches of scoparia, normally the (literal) scourge of the bushwalker, were also in bloom; all sweetness and coloured light to suit the season. The flowers bulge with nectar-filled globules. A few year back I saw a Bennetts wallaby supping on some of these flowers. Out of curiosity I too nibbled a few, and they were indeed as sweet as honey. Somehow I have found myself at a buttongrass management workshop. As a bushwalker, surrounded by people who love buttongrass, I wonder whether I should feel a bit like a train-spotter among railtrack engineers? Or a swimmer among hydrologists? Surely for bushwalkers, buttongrass is nothing more than stuff you have to travel over or through, at best an inconvenience, at worst a hated impediment. That kind of thinking has quite a tradition. Consider the following accounts from travellers over the last couple of centuries. A track cutter’s attitude to buttongrass is typified by D. Jones in 1881. Fellow track cutter Thomas Bather Moore and his helpers similarly “put a match” to great swathes of moorland. He describes a typical instance near Frenchmans Cap in 1887. From the same year here’s the more genteel James Backhouse Walker in his travel book “Walk to the West”. Onwards to the 20th century, at the beginning of which photographer JW Beattie made a trip into “the Barn Bluff country”. He and his party are benighted on the buttongrass plains beneath Mt Oakleigh, an experience he doesn’t appear to have enjoyed. Keith Lancaster’s report of a Launceston Walking Club trip to Frenchmans Cap” in 1951, reinforces this desire for botanical diversity. ET Emmett in “Tasmania By Road and Track” describes a trip on the Overland Track in the late 1940s. Let’s hear again the litany of buttongrass descriptors we have so far uncovered: hated, useless, wretched, monotonous, drab-coloured, insecure, exasperating, hazardous, sour, waste. If buttongrass were a child raised on that kind of language, you would fear for its self-image. Can we say nothing more positive about it? At least he is really looking now, and eventually he can’t help but see some poetry in the views around the Navarre Plains. A very different poetry emerges a century later from Australia’s unofficial poet laureate, Les Murray. After a visit to Tasmania in the 1980s, he wrote “Bent Water in the Tasmanian Highlands”, a poem that has been widely praised and anthologised. I suggest you don’t try to understand this poem, but rather just go with its flow of images and words. Murray goes beyond simply seeing. He is having total sensory immersion in buttongrass. Perhaps the first step to us achieving something similar is the simple act of standing. I literally mean standing still in the middle of buttongrass. Is there anything that can give you a greater sense of arrival in the Tasmanian wilderness than being surrounded by buttongrass? Consider what else you might experience. If it’s a hot day, you may feel the stored-up warmth of the peat radiating out towards you, the buttongrass stalks becoming antennae that focus the heat onto you. Or in the rain, cease your talk, soften your breath and listen. Can you hear the dripping of water from the stalks? Do the droplets runnelling down towards the heart of the grass make a sound? And when saturation point is reached can you make out any trickling, burbling or squelching coming from the earth beneath you? If you’re up early on a still morning, look for bedewed webs spanned between the patient stalks. Not one, not a few, but hundreds and thousands of exquisite ephemeral arachnid artworks. When you’ve been in its midst for a while, you may even find yourself removing your hat in a mixture of awe and admiration for what this vegetation community has achieved. On the workshop's field trip many of us had the chance to do just this. For an hour or two we stood out in the south-west’s elements, thinking ourselves brave in our thermals and “Goretices” (that’s the official plural of Goretex). And then we scurried back to our bus and returned to warm and comfortable habitats. 24 hours a day, 7 days a week, every week, every year, every decade, every century, every millennium for the last several thousand millennia, with no time off for good behaviour, these moorland communities have stood out there. Through sun and snow, freeze and thaw, flood and drought, fire and wind, buttongrass has not only stood, but thrived and spread to become the signature floral species of the south-west. It might not be greatly loved, but you have to admire its persistence and success (a bit like John Howard, I suppose). Having gone from the sublime to the gor’ blimey, I would like to finish with reflections on the lighter side of buttongrass. I want to introduce you to three games that you might try when you’re next out among the buttongrass. The first is a time-honoured game, and there are still some who like to play it, even if the correct attire is becoming harder to procure. My experience of this game, which I will call “Where’s Wally?”, dates back to the early 1980s. Picture the scene: my walking friends and I are in the Cuvier Valley, to the west of Lake St Clair. Remember that in this era Goretex is still a dormant synapse in some chemist’s brain, and we, like most bushwalkers, have been outfitted at the nearest army surplus store. Picture us in our khaki woollen trousers, our drab woollen jumpers, hand-knitted woollen beanies, ex-army boots and gaiters. As the rain descends I stop and drop my khaki canvas H-frame haversack, and reach inside for my state-of-the-ark oilskin. But my companions have moved on into the gathering gloom. When I’ve finally got my jacket on, I look up to find that they’ve disappeared. Misty rain blurs whatever distinction there may have been between their clothing and the surrounding buttongrass. As an aside, I will confess that I’ve never actually walked with a Wally, but “Where’s Wally?” sounds better than “Where’s Jim?” or “Where’s Ken?”. And the effect is the same. My khaki-clad companions have become invisible against the buttongrass. The second game sounds similar, but there are key differences. The aim of this game is to seek and find discarded footwear in buttongrass bogs. I call this game “Vhere’s Volley?” for reasons that might require a little explanation. For decades now walkers from mainland Australia, in particular those from NSW, have run a noisy campaign against traditional leather walking boots, preferring Dunlop’s lightweight tennis shoes known as Volleys. Here’s an early example of their propaganda taken from the book “Paddy Pallin’s Bushwalking and Camping” (1985 edition, written by Tim Lamble, pp 48-49). But more than that, Volleys can’t always be successfully extracted along with the foot when you step into a deep mudhole. Thus do buttongrass moorlands become graveyards for inadequate footwear, and deliver us the wonderful game: “Vhere’s Volley?” For this game you simply need a rubber-and-canvas-seeking equivalent of a metal detector, and a pen and paper to keep score. I admit I haven’t tried it out yet, but I would envisage world record scores coming out of places like the Cuvier Valley. The third and final game very neatly combines botany and ornithology. There’s a delightful synchronicity about it in our current context, as it features a bird that is almost totally associated with buttongrass. I’m referring to the ground parrot (Pezoporus wallicus). The alert among you may already be anticipating the name of this game, but I would urge you to hold your council for just a moment. My experience of this game is restricted to the area around Melaleuca in the south-west, but I understand it can be played in many other parts of western Tasmania, even at the Strahan airfield. The key to the game is to find one of these birds before it finds you. This is easier said than done. 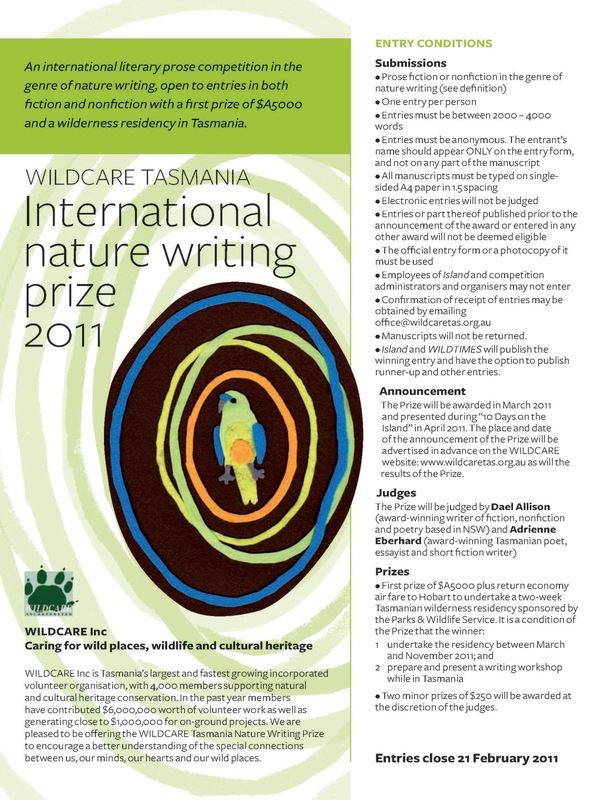 I first played it on the boardwalk between Melaleuca and Cox Bight. As I walked along in a boardwalk-induced trance, I was startled by a sudden rush of wings. A brownish/greenish blur arced across the track, at a very low trajectory, and settled into the buttongrass some 20 metres ahead. Each time I came near, it would repeat the performance, doing so for well over a kilometre. And yet in all that time, despite having a good bead on the whereabouts of the parrot, I could never spot it before it flew off. Of course the game is called “Where’s Wallicus?”, and I would encourage you all to try it out when next in the area. To live is to be in transition. And for me, extended walking is both a metaphor for such change, and an opportunity to reflect on it. 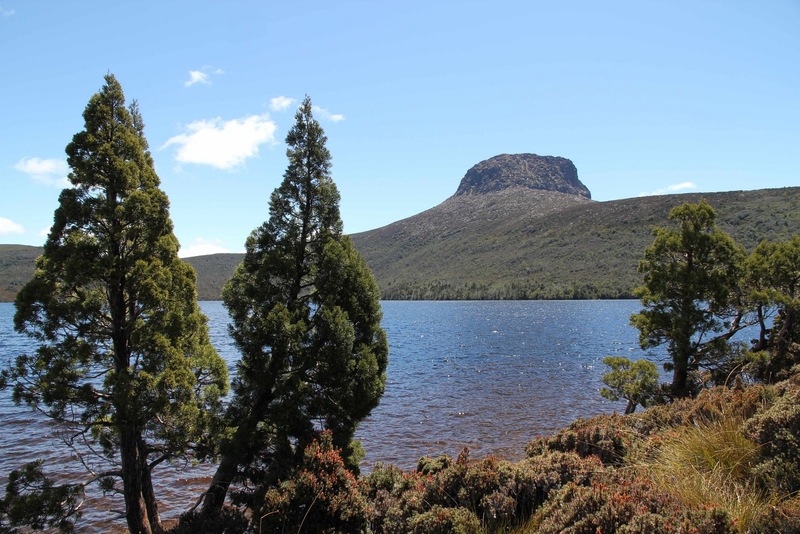 On the Overland Track, with the clutter of urban life on hold, transitions become clearer. For a start there is the weather. It comes and goes in all its swirling, inconvenient, thrilling, inexorable and transitory glory. And for better or worse, you’re out there with it. On day two we leave Waterfall Valley with cloud shredding from the summit of Barn Bluff. By the time we reach the turn-off to Lake Will, hardly an hour later, the spring sun has burned the cloud away. For the first time in many visits to the area, I will see Lake Will in still and brilliant sunshine. The lake is shallow, formed in an ice-scooped depression left behind by the last glaciation. If the lake has any frozen memories, it is keeping them to itself today. It shimmers and scintillates beneath the darkly handsome bluff. Yet the next day the cloud will return, and the day after that Barn Bluff, along with all the higher peaks along the track, will have a light cloak of new snow. We are noticing other transitions by then. Before and after Lake Windermere, we begin to conjecture that buttongrass rules here. The high, wide and gently undulating valleys are covered in the sedge and its associated species. They give the area such a tawny gold hue that some European explorers envisioned vast livestock herds grazing here. 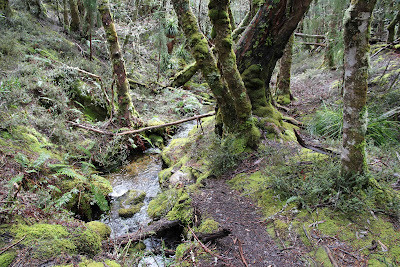 But then, quite suddenly, as we draw close to Mt Pelion West, we dip into wet forest. The mountain draws moisture to itself, even here on its leeward side. That combined with the easterly aspect and the steep slope, lays the foundation for a forest of myrtle beech, sassafras, king billy pine and celery-top pine. In human terms buttongrass’s dominance is ancient, partly the result of Aboriginal burning over perhaps 40 000 years. But the wet forests which have retreated to the soggy slopes and gullies are another order more ancient still, dating back to Gondwanan antecedents that originated maybe 100 million years ago. Here in the Pelions the interface between wet forest species, and grasses, sedges and trees such as eucalypts, represents an evolutionary frontline. It is the transition zone between ancient moisture-loving, fire-sensitive plants and those which ultimately benefit from fire and drought. If you combined the patience of Job and the life span of Methuselah, you would still struggle to witness this botanical changing of the guard. But if – as seems likely – we are in transition from cooler and wetter to warmer and drier climate, it’s a change that looks irresistible. All the more reason to love what we have while we still have it. 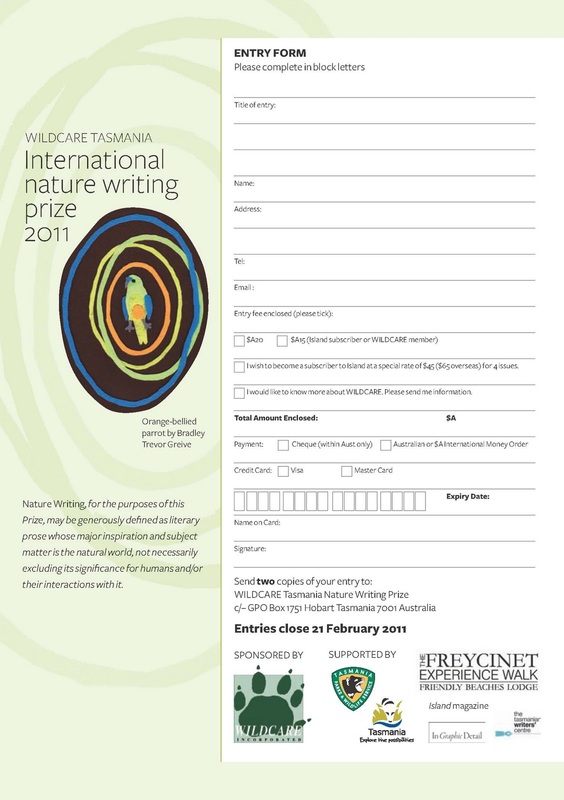 $5 000 in cash, plus airfares to Tasmania, and a two week writer's residency in one of Tassie's wilderness national parks! If I were to find myself in a deep, dark dungeon, and was striving to recall one sound that would lift my mind into clear, bright skies, I would choose the call of the currawong. 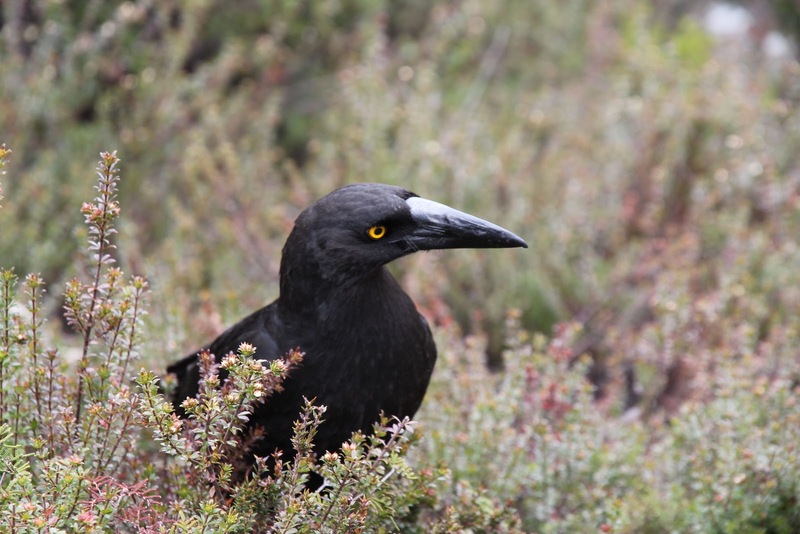 And not just any currawong: it would have to be Strepera fuliginosa, the black currawong, found only in Tasmania. It’s early afternoon, mid-November, and the currawong’s kar-week, week-kar call welcomes us to the start of our Overland Track trip. It is a sound that locates me in the Tasmanian highlands as surely as a café accordion and a man saying ooh la la would land me in France. But just as the French might equally be arguing football or discussing Proust, so the currawong’s claxon call is far from its full story. Or so we will discover. The weather is clearing after early showers, and currawongs are cavorting in the early afternoon sun. After the initial pack-settling climb, we pause at Crater Lake. 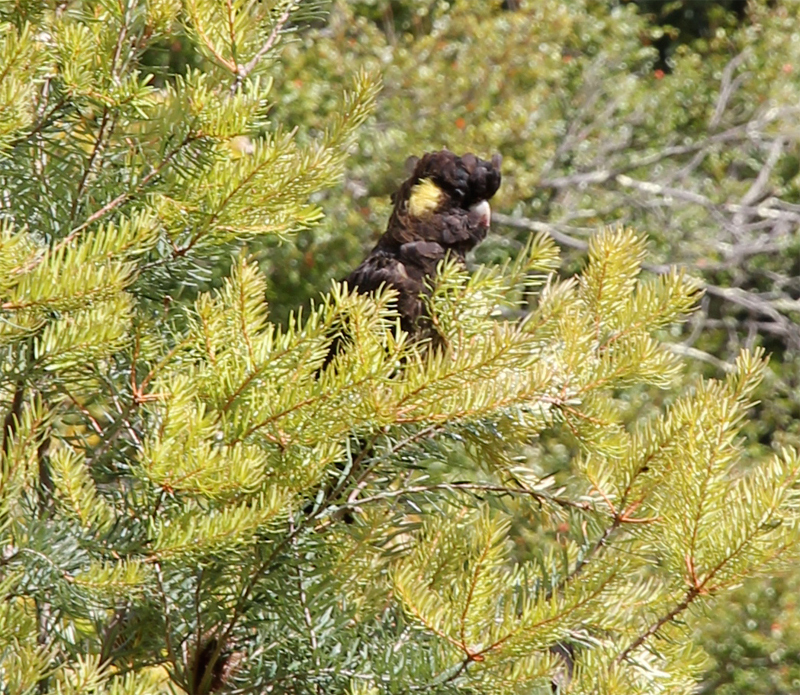 A currawong hops up for a close inspection of our packs. It is all swagger and golden-eyed defiance, the large cutlass-like bill betraying its piratical attitude. I casually warn the first-time walkers not to leave their packs unguarded. These intelligent and inquisitive birds have learned a few tricks, including pack-invasion. The two Dutch girls in our party look unconvinced: they’ve already heard enough drop bear, yowie and tiger leech stories in Australia to make them wary. I click off a few portraits of the handsome pirate, then turn to concentrate on the grunt up Marions Lookout. The currawong’s call remains our occasional companion, along with its other “calling card”. 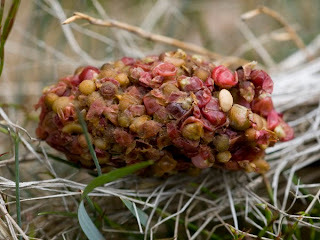 These are its casts, odd-looking pellets that are somewhere between ugly red scats and huge, deformed raspberries. The casts are in fact undigested food, particularly pinkberries (from Leptecophylla juniperina), regurgitated by the birds. Pelion Gap is the next place we actively notice the "pirates". Wooden platforms have been built here to manage this high traffic junction, where walkers wanting to climb Mt Ossa or Mt Pelion East can leave their heavy packs. Since they've learned their special trick, the currawongs have transformed the platform into a seasonal galley. On a busy day there may be more than forty packs left at Pelion Gap for hours at a time. And the trick? Currawongs have learned to use their beaks to unzip packs. Once the pack is breached, the birds probe for any and everything they take a fancy to. Walkers have lost food, money, even passports to marauding birds. The defense is to either cover your pack with a groundsheet - as the commercial groups usually do - or turn your pack onto its zips so they are minimally exposed. The three of us preparing to climb Pelion East do the latter. But when we come back, we learn that even this might not be enough. The top pocket of Tim's pack has been breached, and his mobile phone has been lifted! After a quick search of the scoparia bushes, he locates the phone. Luckily it's still in its zip-lock bag, and undamaged by the scudding showers that have swept the Gap while we've been summitting. We can only suppose that the currawong grew tired of waiting for a signal and chucked the phone. As I said, a smart bird!